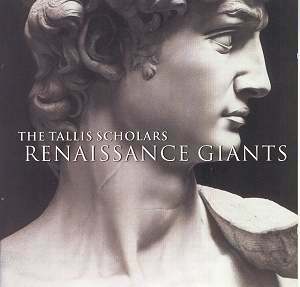 This is a specially priced 2CD compilation of some of The Tallis Scholars� notable recordings from the mid-1980s and early 1990s. Keen collectors can already be heard rummaging through their collections to see how many of these recordings they already have, but through the ugly din of clattering jewel cases shine some of the jewels of vocal musicianship in the last two decades. Purchasers who are lucky enough to possess these works already can now spread the word with this, the classiest stocking-filler this side of 2006. The High Renaissance is replete with cultural giants. Leonardo da Vinci, Raphael and Michelangelo all represent a period when the human spirit seemed to expand and gain in confidence. There are few more visible proofs of this than Michelangelo�s seventeen-foot-tall statue of David, the theme for the illustration on the cover of this set. �This collection is designed to illustrate the musical side of this astonishing period in European history, from England via Flanders and Spain to Rome.� Indeed, this it does, quite magnificently. Throughout the Renaissance period there was a fashion for taking popular tunes of the day and arranging them for their own purposes. John Taverner chose the beautiful melody known as �Westron Wynde�, a love song which encourages the wind and the rain to do their worst so long as the singer and his beloved can be together. This piece is unusual in that the tune is quoted thirty-six times, something certainly unsurpassed in this period, and only rivalled much later by Purcell. The tune is often undisguised, and Taverner resists any temptation to pad the piece out with extra material. The variations are however always interesting, and there is plenty of variety between solo and full choral passages. The Missa Pange lingua by Josquin des Pr�s is perhaps his best known work, and thought by many to be his last Mass-setting. It is not dissimilar from Taverner�s Western Wind Mass in conception, being a set of variations on a well-known chant melody, this time from the liturgy for the feast of Corpus Christi. Josquin however almost never quotes it without some kind of embellishment or deviation, and it often so hidden in the polyphonic texture that the whole composition can be thought of as a �fantasy on a plainsong�. William Byrd is best remembered for his many small-scale pieces which, despite their lack of grand scale, revolutionized composition in England. Byrd, in common with many composers of his time, turned his hand to every form of music required of him. Instrumental and vocal forms were transformed by his genius, something which put him greatly in demand and allowed him to work for both the Catholic and Protestant churches in a time when such practices could spell professional suicide. Byrd�s Mass for four voices is one of the three Masses he wrote in the 1590s and published, without title pages, in defiance of the Protestant ban on Catholic music. The Spanish sixteenth century had its own great names, many of whom flourished under the patronage of the Catholic Church. Tom�s Luis de Victoria was ordained priest in Rome in 1575 he spent the years from 1587 until his death employed at the court in Madrid, initially acting as chaplain to the Dowager Empress Maria, for whose funeral he wrote this Requiem in 1603. Victoria only wrote sacred music, but for many the six-voice Requiem is without rival amongst High Renaissance masterpieces. The slow, inevitable unfolding of this music has an irresistibly gorgeous serenity which is an appropriate close for this magnificent set.